Back in March of this year, we were in Antalya for Runatolia, a running event that Barry took part in. If you followed the posts, you’ll know that we took a hire car with us. And, on the way back, because we wanted to see the ruins of ancient Myra again, we did a mini D400 coastal road trip rather than returning via the quicker yayla mountain road. The D400 is just a dream of a road to drive along with so many places to make a stop off en route from Antalya to Fethiye. 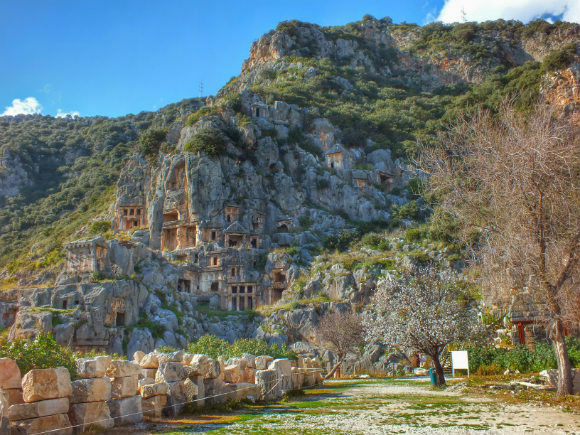 We’re in Lycian Turkey here…and Lycian rock tombs and sarcophagi, Hellenistic and Roman ruins cling to cliff faces which then lead to deep valleys, plunging towards the Mediterranean. It all makes for dramatic driving scenery! We decided to make two stop offs as we drove along our route. First stop was beautifully deserted Adrasan Bay where we both agreed we could quite easily stick around and lose ourselves for a few days in the future. And second stop, heading closer to Fethiye, was the small town of Demre. Modern day Demre is famous as the burial place of St. Nicholas (better known as Father Christmas or Santa Claus for many of us). You can visit the church and the tomb of St. Nicholas, and many people, when they come to Demre, combine this church visit with the town’s famous archaeological site, Myra. But this is us, you see. Running out of daylight hours because we were so confused by Antalya city centre’s road signs and one way systems. Who knows how long it took us to actually negotiate our way out of the metropolis and onto the open road? So, decision made, we took a right off the D400 highway and headed through Demre, following the signs towards the archaeological site of Myra. And we followed them slowly! Demre is no stranger to a pothole, we can tell you. We weaved and swerved while locals, clearly in the know about where each gaping crater suddenly appears from, overtook us…and some of them were only in chugging tractors! Anyway, flags and potholes all made for an interesting few minutes’ drive to the site – which was completely deserted when we arrived. A Turkey travel tip here, for you: The majority of Turkey’s sites and museums are closed on Mondays. We are fully aware of this fact and, yet, wherever we go, we always seem to choose Monday to do our little history and culture duties. Many is the time we’ve arrived somewhere to find locked gates! However, the Turkish history and culture gods were smiling on us that day because Myra was open…and we had the whole site to ourselves. Apart from the bored guy in the ticket booth, there was not a soul to be seen. Bliss! As with many sites on the tourist map (Myra has large car parks for the coachloads of tourists that arrive throughout the summer months), we ambled through a row of market stalls selling souvenirs related to the site…oh, and some clothes and pashminas, too. You can’t not have souvenir shopping areas in Turkey without a few floaty garments for sale. It just wouldn’t be the same without them. We didn’t understand a word of what was written on any of the signage; most of the tourists that visit Myra are clearly of the Russian variety and our Russian language skills are non-existent. 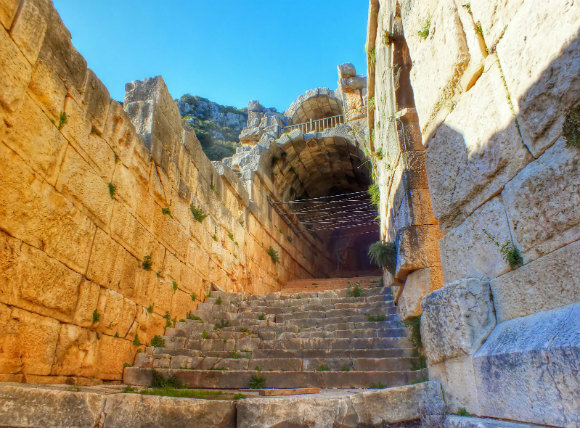 Wandering around the site, photographing the Lycian rock tombs and climbing through the tunnels of the Roman theatre, when you’re not dodging crowds – the whole experience is just so much more evocative. Springtime blossom on the trees and a clear blue sky – new life against a backdrop of what has passed. Just perfect! And the Roman masks that have survived for thousands of years, more or less intact. We probably spent more time admiring those then we did around the tombs and the theatre. Usually, there’s a missing nose or a few chunks here and there which force you to use your imagination. But these masks are so detailed. Very impressive! Much of Myra remains to be excavated, and is currently underground, so it doesn’t take you too long to explore the site itself. We do a lot of our explorations of Turkey during spring and often have archaeological sites to ourselves. 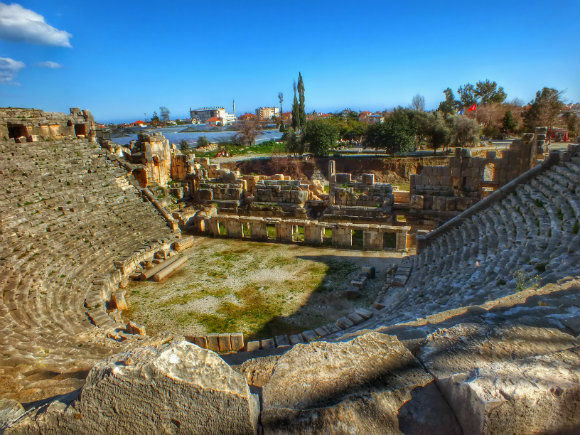 Just like when we visited Letoon and Xanthos, sitting on the steps of the theatre, overlooking modern day Demre stretching out below us; well little things like that are what we remember, just as much as the history. What you look out over is (also just like Letoon and Xanthos) a sea of poly tunnels housing Demre’s main income source of citrus fruits and tomatoes. We are completely spoiled in this area of Turkey to have so many Lycian sites to explore. 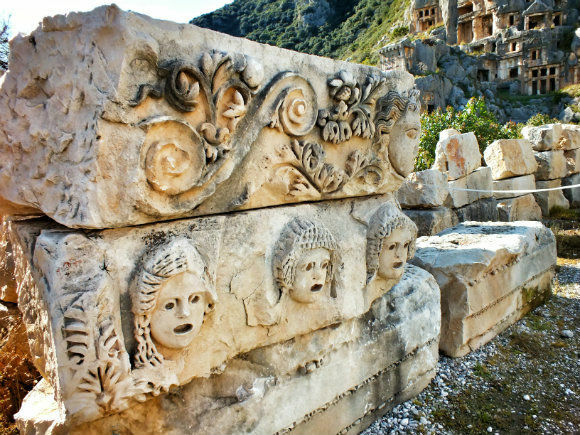 We’ve got the Fethiye rock tombs right on our doorstep – and you can’t help but form your favourites. 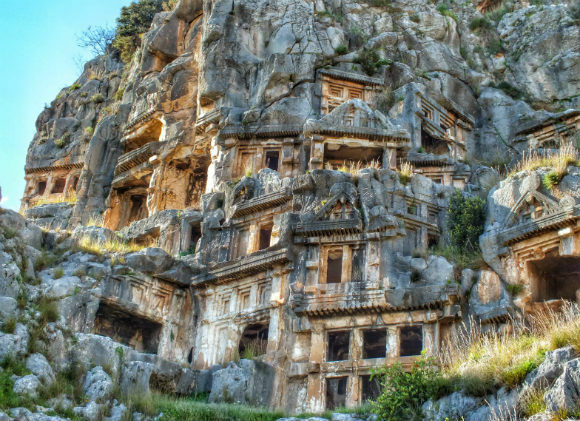 Myra was an important city in the Lycian Federation and, according to the Rough Guide to Turkey, the Lycian rock tombs here are some of the best examples of the house-style tombs…but is it a favourite for us? Oh, apologies, dear Myra. You are a must-see for people in the area and we’ve even felt the need to visit you twice. We do like you…but our dearest Tlos will still always take first place for us. Myra is open daily throughout the year. Entrance fee to the site in spring 2015 is 15 TL (free if you have a Müzekart). A visit to Myra can be easily combined with a visit to the Church of St. Nicholas and also, the ancient Andriake harbour, which is just a few kilometres away. St. Nicholas, Santa Claus & Mediterranean Turkey – What’s The Link? Thanks a lot Krista. High praise coming from you, with your photos! 🙂 Myra is a great site to visit but springtime makes it even more perfect.